I know this took longer than expected, or at least longer than I expected. Burnell says he’s just had a lot on his plate. I reminded him of exactly who he worked for, and who was responsible for the food on that plate. Well, it seems to have lit a small fire under him, because here it is: “A Victorian Salon: Featuring Nora The Piano Cat.” I picked 12 of my favorite photos and Burnell transformed them on the computer to resemble works of art, which is not all that hard seeing that I’m pretty much a work of art just as I am. 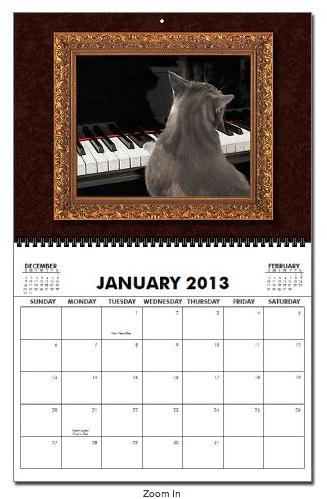 This high-quality 12-month Wall Calendar is printed on thick 100lb cover weight paper. The thumbnails below show the 12 images and the calendar cover page. Feel free to click away. Beautiful pictures of a beautiful Kitty.